Only a small handful of very dedicated railroaders have ever attempted to understand my trackplan. The usual reaction when first seeing what's been built so far is "Wow...(this guy's NUTS!)". They usually don't mention that last part, but it's pretty obvious from the looks on their faces. And they're probably right. My love is BUILDING the railroad and on rare occasion, OPERATING the railroad. I don't have any hope of ever finishing the construction and that suits me fine. This is the third railroad I've built and it took nearly a year to develop the plan back in the early 1990's. I designed and built the house above it (starting in 1979) just so I'd have enough room. It's almost large enough. The main room measures approximately 50-feet x 26-feet. Ever since construction of the railroad began, I've been working (as time allows) from the very original pencil drawing I made, filling in minor details as I go. The hand drawn plan has now become faded and a bit worn, but still contains far more information (grades, elevations, radii) than what is presented here. Obvious to narrow gauge fans, the railroad is yet another version of the Rio Grande Southern (RGS) once located in southwestern Colorado. As a young man I was fortunate to get my first real job working on a dam project located just outside of Montrose, Colorado. I quickly became intrigued with the San Juan Mountains -- their granduer, history, and home to the RGS. The period I chose to model is late fall, 1939, with many exceptions. The RGS trains depart Ridgway (40-inches above the floor) and slowly climb to Dallas Divide. (The ruling grade on the RGS is about 3%, just as the trains depart Ridgway. The rest of the grades are 2% or less, and much of the hidden track is level.) As the trains make their way to Dallas Divide, they skirt the town of Silverton on a ridge along the back of the town. Reaching Dallas Divide, the line drops quickly to Placerville. As with the prototype, the trains then begin their long climb to Lizard Head. At Vance Junction, the branch to Telluride first drops to Ilium and then climbs Keystone Hill. After reaching the town, the line continues until it reaches the mills of Pandora. From Vance Junction, the mainline continues around Windy Point and crosses the Butterfly Trestle. It soon makes the expected loop in Ouray and climbs to Trout Lake. The lake itself is approximately 11-feet long and 4-feet wide with a trap door near the center to allow occasional access. Lizard Head Pass is reached next, the highest point on the railroad at 31-inches above Ridgway. Dropping from the pass, the line crosses the Gallagher Trestles and eventually enters the town of Rico. A major break from my time period occurs in Rico in that I've also included the Enterprise Branch above town, allowing for some interesting mining track operations performed by a shay. Most of this branch will be located on the upper level above Durango. Continuing on from Rico, the mainline passes through a long tunnel. Just before entering the town of Dolores, the branch to the logging town of McPhee departs. Leaving Dolores, the line is mostly hidden until emerging outside of Durango. There's ample room for an additional town along this section (Mancos? Hesperus? ), but, hey, I had to stop drawing lines somewhere! 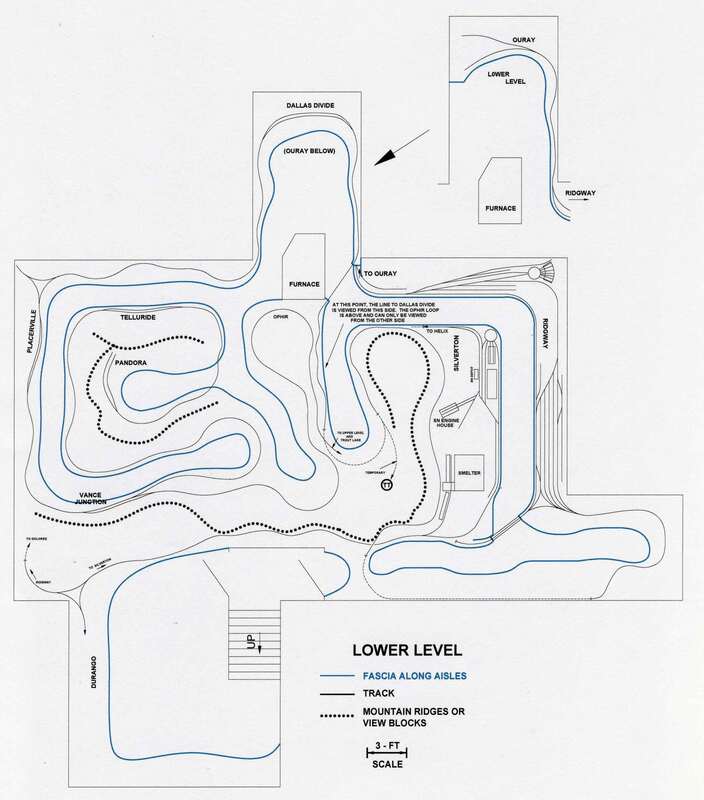 Staging for Durango will be located beneath the stairs. As you can see, a wye located outside of Durango allows the trains to pass onto the Silverton branch for continous operations. It's not prototypic but hopefully very useful. And yes, the branch from Durango to Silverton is also included, threading its way along the Los Animas River, complete with the "High Line" located just outside the windows at the bottom of the stairs. At Silverton the D&RGW interchanges with the Silverton Northern (SN) Railroad, which has its engine house and depot located there. 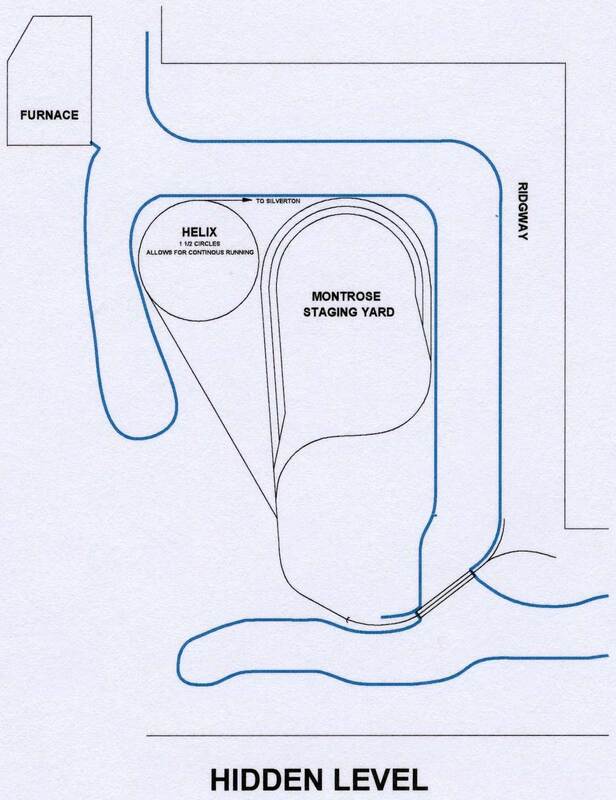 The SN trackage departs Silverton by entering a tunnel, the top of a helix that drops to the Montrose staging yard and completes the connection for continuous running. When I first began construction (about 1993), a temporary wall was built running between the furnace and the stairs, dividing the main space in half. The wall remains in place today, but its demise is coming soon. The "Durango" half of the railroad is still my woodshop, much used while building the house but now seeing less and less activity. It's sure been handy, though, while building the half of the railroad located in the "Ridgway" room. This latter half is now nearing completion. The Ridgway room mostly lacks structures -- an odd situation, since I've been designing and selling structure kits for nearly 25 years. Current operations are somewhat awkward. I've added a "temporary" track (marked "TT" on the plan) that connects the line to Dallas Divide to the line leaving Dolores. This allows running trains from Ridgway to Dolores and McPhee. I can also run from Ridgway to Silverton via the helix. 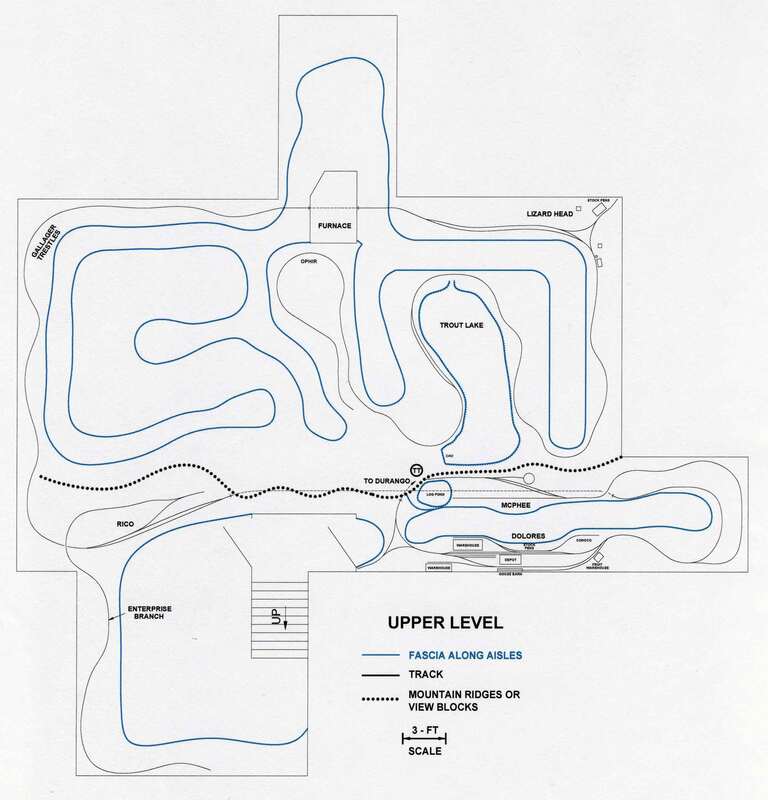 Unfortunately, the Upper Level cannot be easily connected to the Lower Level at this time, so, operationally, Trout Lake and Lizard Head sadly remain as a second, isolated railroad. The "boss" has told me many times that I shouldn't think about moving on from the Ridgway room until it's complete. And keeping the boss happy is important, right? Recently, though, things have begun to change. I'm currently prepping the next small room for the town of Ouray and Dallas Divide. Unfortunately, it won't be an easy task connecting Dallas Divide to the rest of the layout, even temporarily, and a THIRD railroad will become a reality. To solve this problem, I suspect the big move into the Durango room is not far off...much to the delight of my railroad buddies...but maybe not the boss. I try to avoid the subject.